Starting GPS Co-ordinates: N51 11' 90" W000 87' 70"
Finishing GPS Co-ordinates: N51 12' 90" W000 88' 90"
To see: Shortheath Common nature reserve, tumulus. A strange greenlane, this one. Beginning at its south-eastern end on Oakhanger Road, the byway initially starts life as part of the residential road called Bolley Avenue, but on passing through the houses quickly becomes Gibb's Lane. Needless to say, the going is incredibly easy as this stretch of the lane is basically just a metalled road. As such the lane holds absolutely no interest to the greenlaner. A tumulus can be found just to the west of the lane at this end, but there is nothing at all to see above ground. Once the tarmac ends, however, where the passes Chestnut Farm, it becomes a little confusing. Basically greenlaners are confronted with a decent sandy surface on three different paths. That to the left heads almost due west and is technically a footpath, but it appears to hold vehicular rights as we saw cars parked up there and a Mitsubishi 4x4 emerged from there. 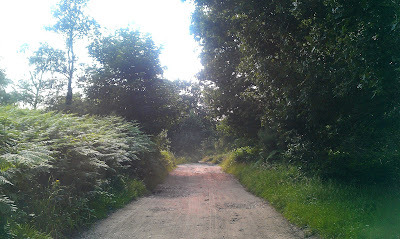 The northern-most choice is bridleway and should be avoided by all motorised vehicles. We drove the UCR section which, when driving westbound, was the 'middle' option that in fact bears to the right and takes a more north-westerly track to its termination on Roman Road. (which isn't, apparently, an actual Roman road, though one did run nearby to the west). Sandy and well kept, at no point on its entire length is this lane the remotest challenge nor is it particularly enjoyable, and only really offers any interest as access to the beautiful Shortheath Common nature reserve.